Having an Open House at a modular home factory for prospective home buyers happens somewhere in the US almost every weekend. Authorized new home builders advertise the Open Houses and the factories usually put something on their website about it. Hundreds of thousands of emails go out every year inviting buyers to attend a day at the factory. The people at the factory put their best foot forward and try to make sure everything is ready for the onslaught on people that both their marketing and their builder's advertising bring in. 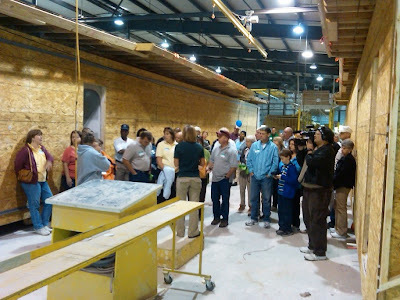 If you have never been on a modular home factory tour, call your local builder or factory and ask when they are having their next Open House. Now let's switch gears and see how many modular factories hold Open Houses for new home builders. It's not as easy as it sounds to organize a builder Open House. When the factory holds one for the general public, it usually takes place on the weekend when the factory is idle and lasts for only a few hours but builders don't want to see an idle plant, they want action. That means holding the Open House during the work week and it could take 6 hours or more to give the builders all the information they need to make a decision about joining with the factory. Very few factories hold builder Open Houses. A couple of problems face a factory that holds one for builders. First, the builders might be traveling up to 400 miles to see the factory which means they need a hotel room and meals. In order for the factory to make it worthwhile, there has to be more than just 3 or 4 builders attending. All hands on deck when the builders arrive. Every department must be a showplace and have people available to answer questions. The factory has to have production. That might sound obvious but some factories can go a few days without anything on the production line...oops. Before any of this happens, every sales rep is required to cold call as many builders as they can and invite them for a specific day which will probably only suit 1 in 3 of the builders that actually agree that they might attend and listen to the spiel. A marketing plan must be designed; something that doesn't usually happen even in the best of times; sales managers and reps must buy into getting out there and making it happen, department heads must also want it to be successful. Department heads usually don't want visitors into their private worlds and probably won't take much of an active part in the process. Hundreds of phone calls and thousands of emails along with written invitations must be made in order to make for a successful Builder Open House. It not that the factory isn't really trying to do it right, it simply boils down that unless the factory offers meals and lodging, most builders won't show up. And how many new builders does a really successful campaign bring into the factory's fold? If the factory is lucky, they will get 5 - 10 new builders but only a few of those will ever buy more than one house from the plant. There has to be a better way for factories to get more site builders into their plants to see the remarkable things going on in there and show them the numerous advantages to modular construction. Coach, you are so right about all the things that need to happen. I've been to two factory open houses. One was very well done and I wanted to do business with them but I was told that another builder had just signed up for a territory that included my area. I found out that the builder never bought a house from them and I went on to build 64 homes with another factory. The second open house was a disaster. I drove 3 hours to get there, had to buy my own lunch and was home by 4PM. Nobody from the factory ever contacted me and I still don't know if they have a builder in my area. Sometimes I think the factories shoot themselves in the foot way too often. I am a sales consultant with a family owned modular company and we are always open to finding the right business partner in the right area. Obviously, if you were one of our builders you would appreciate us not signing up another in "your area". If you would like, please send your info and if you are in my area, I will respond and if not, I will pass you on to the sales consulant who manages your area. In regards to territories. I have watched factories " protect" their builders by not signing up a builder in the same area. When you ask the factory how many homes that builder has produced in 2 years you will get an answer of probably 1 or 2. And this is who they are protecting! In the meantime, the successful builder who builds 10 to 20 a year is turned down. I have no pity for the factory when its line is empty and they have to start laying off people.They shoot themselves in the foot time and time again and deserve exactly what they earned through this archaic method of protecting their builder. They should simply tell that protected builder that another builder wants to be in their area and unless they can produce more homes for the factory, they will have competition in the area. In the meantime, those great non- producers are still "protected" and the orders continue to go on the downard spiral. Go figure!